Last week we submitted a paper (arXiv) on simulating the direct gaseous collapse into a massive black hole, led by Osaka postdoc Kazem Ardaneh. This work is a companion to an earlier paper led by Yang Luo, a postdoc at the University of Kentucky and Osaka. It provides more realistic conditions (mass distribution, turbulence & rotational properties) to study this catastrophic collapse. Here we used the same radiation hydrodynamics machinery to follow a cosmological halo collapsing to stellar densities. 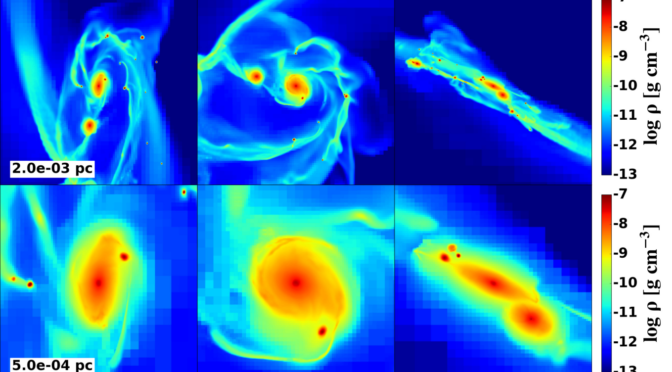 We study the complex interplay between the strong inflowing gas and the radiation coming from the photosphere of the nascent star. The luminosity of the central object strongly fluctuates around the Eddington luminosity (10^38 to 10^39 erg/s) and grows to 10 solar masses only within 35 years. This object is thought to be the seed of a supermassive star on the order of 1,000 to 100,000 solar masses that continues to grow from the strong inflows, even in the presence of radiative feedback.